The Winslet Slat Amish Dining Chair incorporates classic design elements with a modern, contemporary touch. 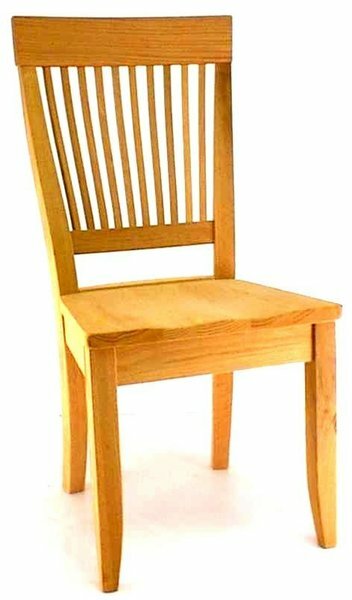 This all wood dining chair also offers the choice of upgrading to an upholstered seat for a bit more comfort. You customize the chair in over 7 different woods such as walnut wood or quarter sawn white oak wood. After you select the wood, you can then choose to have a natural finish with just varnish which really highlights the beauty of the wood. If you prefer a stain, then choose from many shades or light or dark finishes. We also offer painted finishes and two tone finishes. If you need wood and finish samples to help you make this decision then please give one of our Amish furniture specialists a call today at 1-866-272-6773. Overall Width: (Arm Chair) 22 1/2"
Overall Width: (Side Chair) 18 1/2"